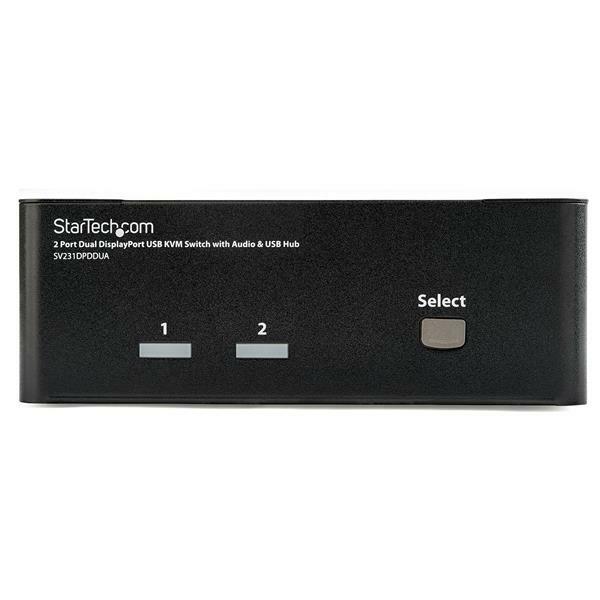 The SV231DPDDUA 2-Port USB Dual DisplayPort KVM Switch with Audio and USB 2.0 Hub combines next generation digital display standards with seamless KVM control, allowing you to switch between 2 dual head or twin DisplayPort systems. 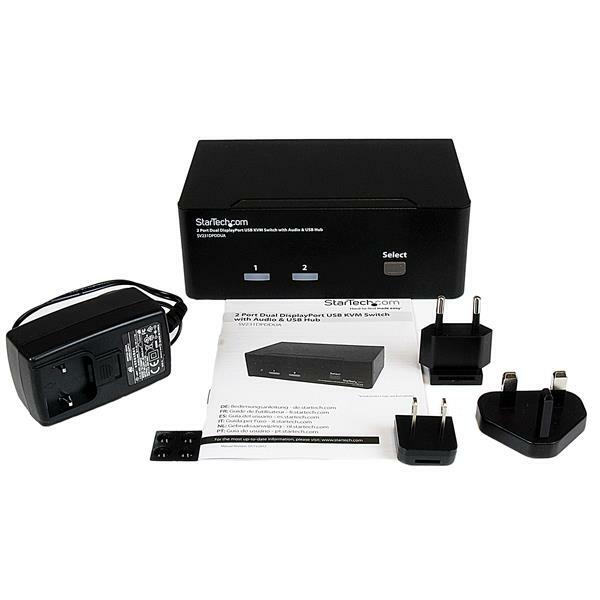 Also ideal for systems with a single DisplayPort output, and a second video source such as DVI or HDMI, using a low cost accessory adapter. 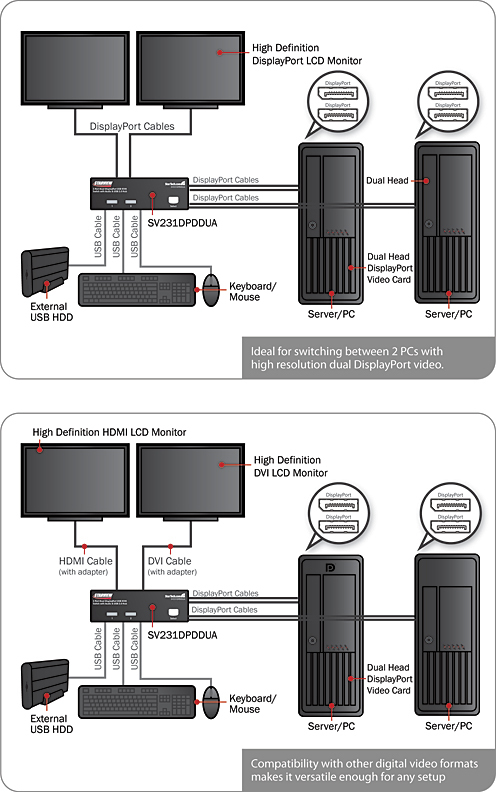 Delivering multi-computer control for high-res multimedia applications, the dual view KVM supports resolutions of 2560x1600 (@60 Hz) with DisplayPort HD audio, as well as 2-channel analog stereo audio and microphone input. 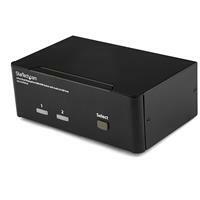 Suitable for high quality static imaging, such as medical applications (MRI, X-ray, etc. ), a maximum resolution of 3840x2400 is supported at reduced refresh rates. I bought one of these and it was defective in an obscure way. Tech support were patient and diagnosed it, then sent a replacement. The new unit works brilliantly. It manages sound and a large stack of USB devices without a hitch. First, let me note I received this item in exchange for an impartial review. That said, please pay attention and know what you want and need before buying this. 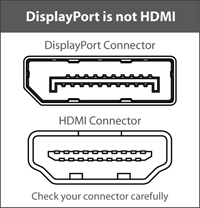 DisplayPort is NOT HDMI. They look similar but aren't and unless you have DisplayPort, you'll need an adapter which will delay things. Past that, this is as easy to use as any other KVM StartTech offers. It's not a low end KVM. 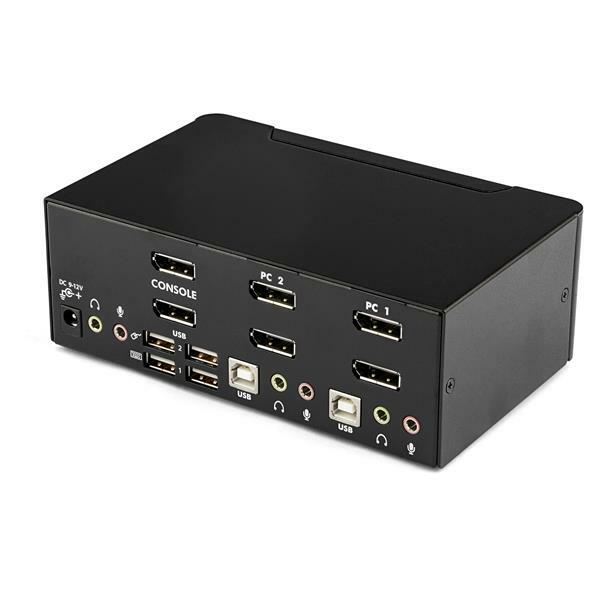 This is serious KVM for people that want and need a professional product. The scenario this solves is simple - Multiple computers, typically a Desktop and a laptop or two towers and one primary monitor, mouse, speakers and peripherals that you want to share with the two computers. Very simple solution to an annoying problem. The construction is really solid as I said above, it's durable and strong, allows some air flow so heat isn't a huge issue and everything fits pretty as well as it could. Unlike the other KVM switches I've got here, this one started out working great and then got really sketchy. I see a few others noted a few problems. I'll just say I've had the same ones almost identical. HOWEVER, it's easily fixed, very intermittent and is seldom a very big problem. To fix it you hit the button twice. Yet it still does seem weird and my only concern is that it seems to have gotten worse over time, the quick fix may not continue working. As long as you know what your components are, understand DisplayPort vs HDMI, have the adapters if you need them, you'll have this thing out of the box and working in a few minutes. I was hoping I had a bad unit until I saw a few other people post about it. Time will tell. (5 stars) Product as described. Works good. I would recommend this to anyone with dual monitors and two pc’s. The only issue I had was that Windows 7 kept adjusting the displays when I switched between computers. It was a real annoyance to find all my windows, icons and screen resolutions messed up every time I switched. I finally after about a week of annoyances found a setting in my catalyst control center to disable display polling which fixed the problem for me. I get dual monitor on both computers, the audio also switches to the computer I'm working on. Does exactly what I need it to. No muss, no fuss. Took 5 minutes to hook up, and it's worked perfectly ever since. After installing this, I noticed serious problems typing at normal speeds. This KVM will either drop or transpose characters as you type them, for some peculiar reason. As a consequence, I find myself plugging my keyboard into the machine I wish to use manually, almost defeating the point of having this. Switching between machines will work, but perhaps because they do not feed any information between the machine from which you've switch and the now-missing displays, something seems to get reset, and you find yourself having to fiddle with settings when you return. It does maintain good video quality (otherwise), and not a problem with the mouse. The keyboard issue is serious enough to warrant a 2 star rating instead of the 4 stars I would otherwise give this. Been looking after lots of these devices for several weeks now and no end of problems. Problems: have to type each key twice at bios level, screens go blank when lost focus or go into powersave mode. Have to switch PC off/on to get video output again. remote desktop comes inactive at times when trying to connect to remote server, have to close down and reopen. These are just a few of the issues, very poor performance for what should be a simple product. I bought this after speaking with Startech's support team, which while they didn't really know a lot about this product, were generally helpful. First the Good news. Supports DisplayPort to legacy adapters very well. I'm running a 30" Apple monitor (w/powered adapter) and 27" hdmi (passive adapter) between two macs. No video problems. Now the Bad news: The unit doesn't recognize a mac keyboard, (according to StarTech support "no KVM does")so in addition of not being able to use the HOT key switching, the unit won't even pass keystrokes from the dedicated keyboard usb in to either or both machines (I got inconsistent results from this- I tried 2 units). Fortunately, the hub works just fine, so if you place the unit where you can reach it, it will perform well (just don't use the dedicated keyboard or mouse inputs). The unit is well priced at amazon and rakuten, and compared to other solutions (which also have their own issues) it's at least workable. Would hope that their Asian development partners start supporting Macintosh products. There are more than just cheap PC's out there!